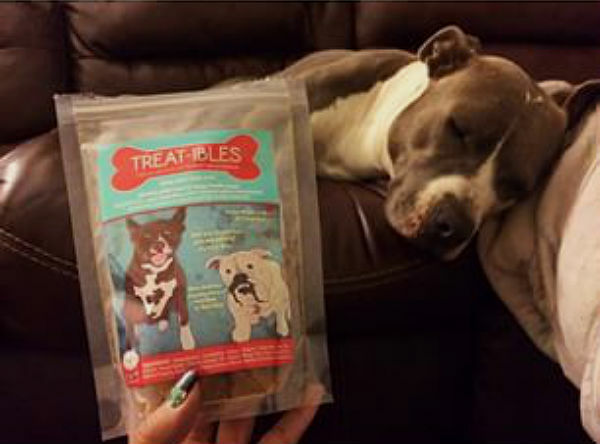 Playing on the term “edible,” the Treat-ibles company has recently introduced a new product which they claim relieves anxiety in dogs. What makes it so different is that it’s derived from marijuana. In marijuana culture, “edible” signals that a form of food, traditionally a brownie or other baked-good, has been infused with THC so the food will have the same effect as the plant. But for the Treat-ibles, the name is more of a joke since their treats contain no THC. According to the company founder, Julianna Carella, Treat-ibles were inspired by forms of anxiety treatment used on humans. Those treatments just so happened to get some of their components from marijuana. The key ingredient is cannabidiol (CBD), which comes from marijuana but is not psychoactive, like THC, meaning that it can reduce stress and relieve anxiety, but doesn’t get pups “high” or “stoned.” Instead, it merely relaxes them. So the difference between giving your dog a Treat-ible and giving your dog a marijuana brownie (something which the Treat-ible company vocally discourages), is that Treat-ibles will not intoxicate your dog nor are they designed to intoxicate your dog. We at BarkPost will be very curious to see how this product is received by pet owners and veterinarians, given the controversy surrounding the issues presented by medical marijuana. We promise to keep you pupdated! Meanwhile, you can learn more in the video below.